In conversations with our exasperated green friends, we are often asked what we would accept as ‘proof’ that global warming ‘is real, and is happening’. This is a fairly typical misunderstanding of the sceptical position. Well, ours anyway. We do not argue that humans have not caused global warming. Our position is that even scientific proof of mankind’s influence on the climate is not sufficient to legitimise Environmentalism, or the environmental policies being created by governments in response to pressure from Environmentalists. It is possible to decide that even 10 metres of sea level rise is a price worth paying for constantly increasing living standards; the problem would be in extending the benefits of that increase to those who, in the short term, might lose out. But too often, environmental policies and rhetoric bear no relation to science whatsoever, let alone ‘proof’. What we believe is happening when people mistake political arguments for scientific ones is that people have lost confidence in making calculations about human values, and so turn to ‘science’ to provide them. Thus we see a mad rush to derive ‘ethics’ from the issue of climate change. It is much easier to create a direction for your otherwise defunct moral compass with a crisis on the horizon. It gives purpose to otherwise purposeless politics. That huge looming catastrophe overwhelms any other considerations that might get in the way. Environmentalism epitomises the widespread loss of moral reasoning. Its desire to possess an unchallengeable moral imperative – as though it were the unmitigated word of God – doesn’t reflect its actually possessing it, but the disorientation of its constituency. When you are lost, you do not look for detail, you look for the biggest thing to orientate you. So it is for Environmentalism. And what could be bigger than the end of the world? Accordingly, Environmentalists have had to defend the idea that catastrophe is just around the corner. It is where their entire political capital is invested. Without it, they are disoriented; disaster avoidance is a poor substitute for goal-seeking. In lieu of a definitive scientific proposition linking anthropogenic CO2 to the imminent end of the world, the idea of a ‘consensus’ was forged out of necessity (not through scientific discovery), allegedly consisting of ‘the vast majority of the world’s top climate scientists’. These scientists agree, we are told, that ‘something must be done’, even if they don’t agree about why, or how they know. It turns out, in fact, that ‘certainty’ relates not to the scientific understanding of the influence of CO2 on natural processes, but the application of the precautionary principle. This fragile and nebulous consensus is protected by a variety of myths about anybody who wishes and dares to challenge it: they have vested interests; they have prostituted themselves; they belong to an organised conspiracy; they stand lonely against a vast and entirely unanimous scientific body. One of the most prominent myths is that sceptics employ a ‘tactic’ to subvert the public’s trust in the consensus by challenging the integrity of the scientific theories it is assumed to consist of (even though these theories have not been identified, let alone confidence in them measured). Along these lines, Naomi Oreskes’ thesis gives it the title ‘the tobacco strategy’, which itself owes much to George Monbiot’s book, Heat, which in turn draws on the Exxonsecrets.org website run by Greenpeace. We have written about the ‘tobacco strategy‘ and its variants before. But it hasn’t gone away, and so, reading an article by custard-pie-thrower-turned-respectable-‘science’-writer, and shrill Gaia-botherer, Mark Lynas, we thought it deserved some further attention. The tactic is, according to Lynas, Oreskes, and Monbiot, to generate doubt about the certainty of the science being presented by climate activists, in order to win public opinion. It is interesting that all Lynas believes he has to win the debate is to claim that the sceptics don’t have to win the debate, and to somehow link ‘denial’ of one form to another, rather than actually have it. He excuses himself from the debate by saying that all that his would-be counterparts would have to do to win it would be to show that doubt exists. Environmentalists generally, and Lynas particularly, don’t like debate, and avoid it. He doesn’t think he needs to have one; ‘the science’ is settled. And from ‘the science’ flow all of the imperatives and moral absolutes, as if from the mouth of God. Instead of making the case, he insists that it is made. Done. Finished. Over. Settled. ‘In’. Won. So, what of the link between the denial of the link between cancer and smoking on the one hand, and the denial of the end of the world on the other? What function is it serving, other than to divert attention from the substance of the case for mitigation, which has not in fact been made? In the case of smoking, ‘denial’ had very little to do with convincing the public that it was safe. Instead, tobacco companies were forced to establish doubt about the link between smoking and cancer because they faced litigation. Whatever the wrongs of ‘denying’ the scientific evidence generally, in the face of litigation it is entirely reasonable to cast doubt on whatever case is being bought against you. That’s the whole point of the legal process; no matter how grievous the crime you are accused of is, and no matter what the strength of the moral case for damages is, you are entitled to a defence. No matter how culpable you are in actual fact, you are entitled to have your defence heard. Courts of law are established on this principle. In the simple black and white moral universe, anti smoking activists and lawyers set to make many millions of dollars are the goodies, and those profiting from the sale of cancer-causing cigarettes are the baddies. But in the real world, things aren’t like that. Yes, smoking is ‘bad’, and the world would possibly be a better place if no one damaged themselves by smoking. But the anti-smokers ought to have considered the consequences of challenging the tobacco industry in the courts. Would it ever make the world a better place? How would it be effective? In the end, it opened the door to lawyers in search of a huge payoff. That is why and how the ‘denial’ industry – if it exists – began. If this ‘denial machine’ is a monster, the part of Frankenstein is played by those who sought to close down the tobacco industry – and free all those slaves to tobacco – in the courts. Nonetheless, prominent environmental activists like Monbiot and Oreskes – who, given their academic positions, ought to know better – maintain the image of the evil tobacco lobby in order to ‘link’ its modus operandi to climate sceptics. It’s a cheap shot. And it makes very little sense, not least because, as has been discussed, such ‘denial’ constitutes a legitimate legal defence in the face of litigation bought about by the ‘goodies’, but also because there is no real substance between the two strategies that we wouldn’t find between any form of positive claim about the material universe, and any scepticism of that claim. That is to say that anyone challenging any form of assertion can only go about challenging that claim by casting doubt over it. Monbiot, according to his own website, held a position (fellow, or professorship) in the philosophy department at Bristol University. The mind boggles. Let’s hope that it was not logic which Mobiot ‘taught’. Lynas – not an academic – also objects to challenges to ‘consensus’ science from sceptics. The arguments change all the time: this year it is “global warming has stopped”, while last year it was “hurricanes aren’t linked with warming”, and the year before “satellites don’t show any warming of the atmosphere”. As each argument is laboriously refuted by scientists, the deniers simply drop it and skip onto the next one. In fact, there is some fairly compelling evidence that global warming has stopped since 1998, such as it has not actually got any warmer over the last decade. That’s not to say that anthropogenic global warming has ‘gone away’, of course. And there is some even more compelling evidence that neither hurricane frequency nor intensity have increased with global warming. While IPCC AR4 WGI states that there is a ‘slight’ increase in activity and intensity, they also admit that there is a great deal of ‘natural variability’ masking it. It is, of course, always ‘natural variability’ which is used to wave away evidence that is not consistent with the theory. Never mind that ‘natural variability’ indicates a substantial unknown which needs to be isolated before any guilt can be attributed to humans for changing the atmosphere. And never mind that, as Roger Pielke Jr has shown, normalising storm damage against inflation, population, and wealth yields no signal which would excite warmers. Regardless of whether or not hurricane frequency and intensity have increased, the effect of that increase has been more than mediated by our increasing wealth and population. But that doesn’t stop Lynas using the ‘fact’ (it may well not be one) of increasing intensity and frequency to argue in favour of reducing the very wealth that buffers us against environmental problems! Shooting himself in the foot to mediate the effects of shooting himself in the foot would be less stupid. At least that way, he might still have a leg to stand on. No surprise, then, that Lynas – clearly no friend of logic – refuses to recognise the legitimacy of debate and challenges to the orthodoxy on which his argument is constructed. No prizes for guessing what he fears debate might reveal. Yet sceptics have helped the scientific process produce some notable shifts in the argument coming from the side Lynas believes to be beyond reproach. For example, Steve McIntyre’s continuing work looking at the way global temperatures are derived from proxies has prompted NASA GISS to adjust their methodology, and the temperature record was adjusted as a consequence. Also thanks to McIntyre, the IPCC no longer uses Mann’s famous ‘Hockey Stick’ graph which was the source of so much panic in 2001, when it appeared as a key graphic. This case should tell us about the value of scepticism to the scientific process. Of course, NASA GISS, like many others, constantly appraise their own work. But this process should be open and transparent, particularly as the research is used to inform policy-making decisions throughout the world, affecting the lives – and possibly even the deaths – of billions of people. Why indeed? So much for ‘the science’ then. The ‘settled science’. The science which is ‘in’. The science which ‘won’ the ‘debate’. The science to which the ‘vast majority’ of ‘the world’s top scientists’ all subscribe, yet which they have not seen, they cannot see, and can only have access to if they will not subject it to scrutiny. And there’s the rub. Oreskes, Monbiot, and Lynas – none of them climate scientists, incidentally – make shrill noises about ‘manufacturing doubt’. But in maintaining that the ‘tobacco strategy’ acts against the public interest, they must reject the idea that debate is in keeping with the spirit of the scientific method. Ditto, debate – the fundamental essence of democracy – must also be against the public interest. Who’d have thought that transparent scientific processes and debate are against the public interest? So much for the Enlightenment, too; the age of reason must be over. We must take it on faith that Lynas, Monbiot, Oreskes, and Jones are acting not their own interests but in ours. We have no way of testing that. And they have no way of proving it. We cannot engage in the discussion, we must just accept it. Yet they want the entire world to reorganise its political, social, and economic structures; for the entire world to live different lifestyles; and for our ambitions to be diminished, lest they cause us to behave ‘unsustainably’. That’s easy for them to say. No wonder that all this stuff about doubt and uncertainty becomes so important. Smoke and mirrors. As we have said, the ‘manufacture of doubt’, or ‘the tobacco strategy’ has been presented by various environmental activists as the work of nefarious conspiracy. The story tells that interests within the oil industry have simply re-run the same script to achieve the same effect on public opinion, for the same ends: continued profit. The oil companies, the tobacco companies, and the hired scientific opinion are the ‘baddies’, and the climate change activists, IPCC scientists, and the class-action lawyers are the good guys. That’s all you need to know. But think a little deeper, and a different picture emerges. If the tobacco strategy has its roots in a defence against litigation, it follows that the ‘standard of proof’ set by Oreskes, Lynas and Monbiot to legitimise political action to mitigate climate change is ‘beyond reasonable doubt’. Our exasperated Environmentalist friends, who asked us what ‘proof’ would change our mind, set the bar (pardon the pun) and invite the legal defence. All that needs to be provided to challenge unreasonable certainty is reasonable doubt. It is entirely legitimate, therefore, for sceptics to cast doubt over the scientific case, because the narrative with which Lynas, Oreskes, and Monbiot chose to advance their cause is a courtroom drama. But not only did they invite the legal defence, they also honed the tactics that are now being turned against them by the opposition – they are now on the receiving end of the very precautionary principle that has served them so well for so long. However, what is being sought by this court is not ‘truth’, but guilt. In spite of green claims to possess scientific truth, the emphasis of this process is not establishing material fact, but the elevation of Environmentalism by diminishing the moral character of its detractors. Environmentalists have failed to make the political argument for Environmentalism using science. Instead of achieving momentum for their political ambitions through mass politics (ie, winning the debate, and getting people to join up), the rhetoric instead takes the form of a kangaroo courtroom drama. The guilt is already established: we, the audience, have already seen the ‘crime’: the ‘denial’ of the link between smoking and cancer. Now, we watch the morality play unfold, just as it did during the tobacco wars. If a parallel is to be drawn between then and now, it’s that in both cases the ‘denialists’ were created by the ‘good guys’. Neither the case against smoking nor the case for immediate mitigative action on climate change is justified by the science alone. There are the pesky matters of personal sovereignty and responsibility, political legitimacy, democratic process, and other costs/benefits to consider. Being right and being righteous are different things. Which is why Environmentalists have had to resort to consensuses, to legal action, to judgements by unelected bodies, and to denying the very legitimacy of opposition, in order to advance its arguments. You can say whatever you like about climate change, just as long as it doesn’t appear to undermine political action to ‘save the planet’. You can, for example, be the billionaire founder of the world’s first international, 24-hour TV news channel, and claim that in just 30 or 40 years humans will be cannibals, forced to eat each other’s flesh because all the crops will have died, without people making much of a deal about it. (Into the bargain, you can use your money and influence to advance the political idea that too many people inhabit the planet, and still be called a ‘philanthropist’, without a hint of irony). A textbook used in high school government courses across the country has come under fire from scientists and environmentalists for its misleading approach to global warming. The textbook, “American Government,” presents basic facts as matters of debate—leaving students with the misconception that there is no scientific consensus about human contributions to global warming when in fact a strong consensus exists. The textbook also dramatically downplays the threats global warming poses. … Friends of the Earth and the other involved groups are calling on Houghton Mifflin to immediately send a corrective addendum to schools, and ensure that the corrections are included in the next edition of the textbook when it’s published. None of these statements are factually incorrect, because they are not simply matters of fact. Passage 1 highlights a very important problem with Environmentalism in political science. How do we determine the best course of action when human interests are at odds with what are perceived to be ‘natural’ interests? Environmentalism is problematic because it cannot negotiate this conflict, tending – at best – to apply the precautionary principle in the environment’s favour, claiming (untestably) that ultimately those whose interests are displaced by eco-policies will be better off in the long-run because they wont have to suffer the consequences of environmental degradation. Take Ted Turner, or Sir Crispin Tickell’s view that too many people inhabit the planet, for example. This is ultimately an expression of the idea that people shouldn’t have rights to their own reproductive functions – for the sake of the planet, and it is the state’s role to either regulate reproduction through laws or disincentives, or to engineer values to achieve the same effect. This Malthusian perspective is at odds with other political philosophies which claim that mankind is able to adapt to new circumstances, and to create new technologies through science and politics. And it is indeed a ‘foolish’ politician who challenges this thinking in today’s political climate (unless he isn’t a coward) because he will earn the wrath of the likes of FoE, who position themselves as judges over politicians and policy. That order needs to be challenged if democracy is important. Passage 2 doesn’t even make a statement, but asks a question. It doesn’t even challenge the premise that ‘the earth has become warmer’. As such, it is hard to see why the questions about what to do about it, and the relationship between science and politics aren’t important to political science students. FoE apparently would rather students learn that one side is right, and the other simply wrong, without any appreciation for how the facts of the matter are interpreted by different perspectives. That might be a worthwhile approach if it is desirable to create students without analytical skills. Passage 3 isn’t even controversial. It is an acknowledged fact – by the IPCC themselves – that global warming would create benefits and open up areas to agriculture that were previously inaccessible, or simply too cold. Everyone knows that it’s not simply a case of climate change being all bad effects. The difference between the two perspectives is less about matters of scientific fact, and more to do with how problems are considered in relation to benefits. For example, the Environmentalist’s claim to humanitarianism is that “climate change will be worse for the poor”. Yet this principle assumes that there will always be poor people, and so creates an ‘ethic’ out of avoiding making life worse for the poor by minimising our environmental ‘impact’, rather than expressing genuine solidarity by lending a hand in ending the poverty which prevents development. But this ‘ethic’ is counter-productive. Similarly, the problems that people face in a warmer future are contingent on there being no political, economic or technological developments. And it is worth remembering here that the objectives of political Environmentalism are to divert our ambitions away from economic development, to end our ‘dependence’ on technological solutions to our day-to-day problems, and to reorganise society around small-scale, localised systems of production. Environmentalists seek undevelopment – sheer retrogression – in the face of climate change! Under the political conditions that Environmentalists want to create, our environmental conditions will necessarily cause the problems that they predict. As we have said before, Environmentalism is a self-fulfilling prophecy. Agreeing about the reality and causes of current global warming is not the same as agreeing about what will happen in the future. There is continuing debate in the scientific community over the likely rate of future change: not “whether” but “how much” and “how soon.” And this is precisely why we need to act today: because the longer we wait, the worse the problem will become, and the harder it will be to solve. And as we pointed out at the time, what exists in the future as far as the majority of climate scientists are concerned is not fact, but doubt. e same doubt that Oreskes claims is generated by the “tobacco strategy”. … The Environmentalist narrative of catastrophe, doom, and apocalypse, once given superficial scientific plausibility (in that science cannot exclude the possibility of such things happening – which it never could), provides doubt and uncertainty about the security of the future, which in turn provides political momentum and legitimacy for environmental policies. What is important to Environmentalists is not that we know what will happen in the future – indeed, knowing what will happen in the future would undermine the doubt that Environmentalism thrives in. What is important to Environmentalism is that there is a vaguely plausible argument that it might be bad, and that humans might not be able to cope. Their energies are not focused on developing strategies to overcome the problems they anticipate, but to attacking any approach to them which in turn undermines the culture of doom that gives them political currency. This news comes in the wake of climate activist Jo Abbess’s demands that the text of an article relating to the recent decline in world temperatures by BBC journalist Roger Harrabin be altered to reflect not the scientific reality, but to emphasise the catastrophic narrative. Harrabin did as Abbess asked (probably just to get the shrieking lunatic off of his back… time will tell) and changed the text of his article. 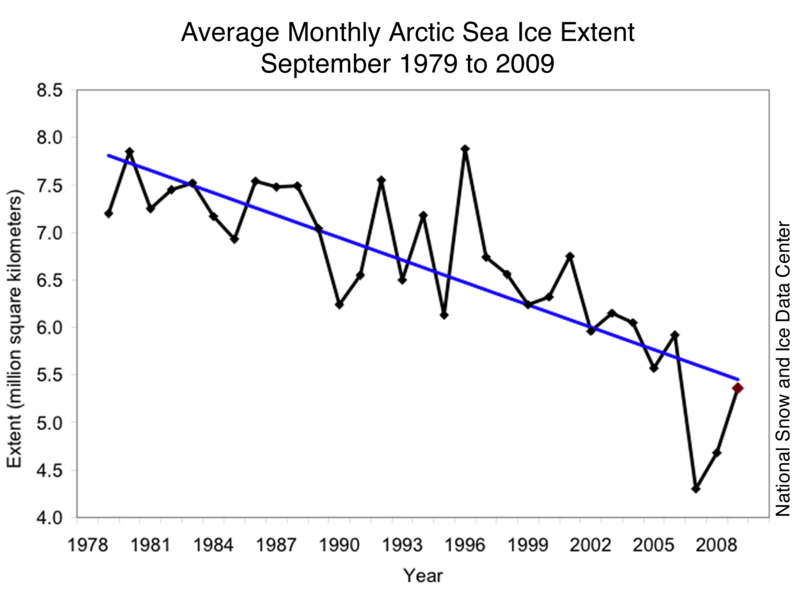 Harrabin’s article related to the fact that global average temperature appears to be declining, attributed by scientists throughout the world to ‘natural variability’. All this talk of natural variability follows a decade of no warming, and subsequent to a variety of claims that we have been about to experience warmer and warmer weather, which have been contradicted later by revised projections, and climate reality, as we reported on Monday. The book was authored by a prominent conservative, James Q. Wilson, who is affiliated with the right-wing American Enterprise Institute—which has received oil industry funding, and by John DiIulio, who served as director of faith-based initiatives in the George W. Bush White House. Well, that’s certainly a lot of money as far as you or I are concerned. But it’s only enough to supply multi-multi-multi-millionaire Al Gore’s house with energy for 60 years, not to mention his travel expenses. It’s nothing in comparison to the billions that Greenpeace has had in its coffers, and nothing in comparison to the hundreds of millions Gore has raised for his eco-army, and nothing next to the billion that Ted Turner has been able to give away, or the influence he is able to achieve. Al Gore’s film was intended to be sent to every classroom in the UK, yet as has been well established, it too is littered with inaccuracies, catastrophism, and outright untruths. Where were the FoE’s demands for scientific integrity then? None of the claims about which Hansen complains are controversial. Points 1, 4, and 5 are well established. The advice given by the IPCC and science academies throughout the world is precaution. We have discussed this above, and recently and in posts about the precautionary principle. Clearly there is fundamental controversy within the scientific community. (Indeed, a letter written on NASA-headed notepaper by Hansen’s boss, Michael Griffin, would make for very different reading.) So what is Hansen really complaining about? hat will mislead students about the facts and science of global warming. In recent decades the scientific community has gathered overwhelming evidence that the earth’s climate is undergoing a period of significant heating, of which human-induced greenhouse gas emissions are a major cause. The scientific community no longer doubts whether global warming is happening. Scientific academies from across the globe, including the National Academy of Sciences, have stated unambiguously that human generated greenhouse gases, including carbon dioxide, are the primary cause of well-documented global warming. His concern that students will be mislead by the idea that there is no scientific certainty about the best way to proceed politically does not credit those students with the ability to understand that political direction has been achieved through the application of the precautionary principle. He knows that precaution is a vulnerable subject for the environmental movement, because it creates different responses to doubt, and so he protects the uncertainty with what certainty can be mustered. It is not controversial that we do not know what the future climate will be. It is not controversial in the scientific community that ‘global warming does exist’. But that statement has no necessary consequences. The consequences are the subject of controversy. And the mainstream response to those consequences is precaution. If we buy into the precautionary principle, we buy into a political, not a scientific perspective. That perspective holds that we might not be able to respond to climate change by adaptation, through political, economic, and technological creativity. If students were to understand that what determines the response to climate change is our political, rather than scientific perspective, then the argument about what to do has been lost. In other words, it is an orthodoxy – not good science – which Hansen is nervously protecting, an orthodoxy which he is determined will not be challenged, and he will use NASA-headed paper to make his point. There may be many reasons to challenge the perspective offered in ‘American Government’. But this is not one of them. No doubt, John Dilulio, a University of Pennsylvania professor, and James Wilson, Ronald Reagan Professor of Public Policy at Pepperdine University, are more conservative than most. But then, most sociology texts are written by people with political perspectives. In the UK, for example, Tony Blair had an intellectual relationship with sociologist Anthony Giddens – the author of many textbooks and ‘third-way’, communitarian and multiculturalist policy ideas. Thatcher similarly with Karl Popper – who needs no introduction. Asking political theorists or social scientists not to have political perspectives is like asking physicists not to have views – or even ideas – about wave-particle duality. And here is the problem. Nervousness about the future precedes and extends well beyond what science can or cannot determine. What looks like an objection to politically-motivated scientific inaccuracy in a textbook brings into relief the fact that people’s minds and the way they see the world are the source of the greatest uncertainty in the world. A political perspective causing such a moral panic reveals only the political exhaustion of the Environmentalists, and, by extension, the movement which considers itself an alternative to conservative thinking – the only way it can think of to challenge conservatism (even though climate scepticism is not conservatism) is to hide behind science, and to call for censorship. No wonder then, that they are against political perspectives in the political science classroom. No wonder they have no confidence in students to make up their own minds about what they read in politics textbooks. Never mind that it was a student – Matthew LaClair – responding critically to the text who started the fuss in the first place. The whole point – now forgotten – of political and social sciences is to challenge, negotiate and explain different perspectives on the world, and to convincingly develop newer and better ones. But that would mean progress. And progress is exactly what Environmentalism stands in the way of. It would rather we unquestioningly adopted simple lives, didn’t demand better living conditions, didn’t ask questions about whose interests the ‘ethics’ of austerity are working in favour of, and didn’t ask why people should have to endure the hardships that lack of material wealth creates. Letting political (forget ‘scientific’) orthodoxy get challenged in the classroom is a sure fire way of allowing a generation of people to grow up disobedient, and worst still… aspirant. How dare they? It used to be conservatives who stood for orthodoxies; traditions, and ‘knowing one’s place’ in natural and social orders. Now, those things seem to be what ‘progressives’ and ‘liberals’ campaign for. But these new radicals are radical in the same way the Taliban are. They want to change the world, but will brook no dissent. They will bring ‘ethics’ to bear on political matters, but deny political perspectives the right of expression. They will claim that a higher purpose legitimises their campaign, but not allow objections to that purpose. As we are fond of saying, Environmentalism has thrived in an era of political exhaustion. Now that Environmentalism is at last beginning to face challenges from political science, climate science, and the results of thermometer readings, it’s time for Environmentalists to grow some balls, and stand up to these challenges, or push off.